Then ... Unaware she is being stalked, the woman leads Scottie along Sutter Street, here passing a beauty salon at 916 Sutter and the tailor/cleaners at 920, between Leavenworth and Hyde. ... and Now, these two addresses currently belong to Dolce, a cafe, and Bellissimo Pizza. A few steps on she enters the Empire Hotel at 940 Sutter (map), where she has a room. He watches from across the street as she opens her window, alongside the letters I and P in the vertical sign. Then ... Which upstairs room is this? When Hitchcock's camera scans the hotel (below) we see that it was the second one up, which today is room 401. (In a later scene the letter P is visible outside the window from the interior, further confirming room 401). ... a few years ago ... the Empire was subsequently renamed the York Hotel, seen in this 2004 photo. ... and Now, the hotel has since been acquired by new owners and is now called (guess what?) the Hotel Vertigo. The exterior, new paint aside, retains the same look. Then ... Scottie cannot restrain himself; he finds her room and knocks on the door. ... and Now, the corridor above was a studio set but Hitchcock often based his reconstructions on real locations and sure enough the actual corridor has the same feel (below), although the door at left is a few doors down from room 401. Then ... He talks his way in and finds out that her name is Judy Barton, a sales clerk who works at Magnin's in town. Anxious to find out more about her, he persuades her to let him take her out later for dinner. (On a trivia note, Kim Novak later said it was a relief wearing this dress with no bra after being straitjacketed for so long in Madeleine's constraining grey suit). ... and Now, the room scenes were filmed on a studio set based on room 401's layout except that Hitchcock decided to flip it so that the entry was on the left side, not the right. A photo of today's room 401 is shown below, flipped to demonstrate the similarity - the bathroom (behind the mirrored closet) relative to the entrance location matches the layout in the movie. 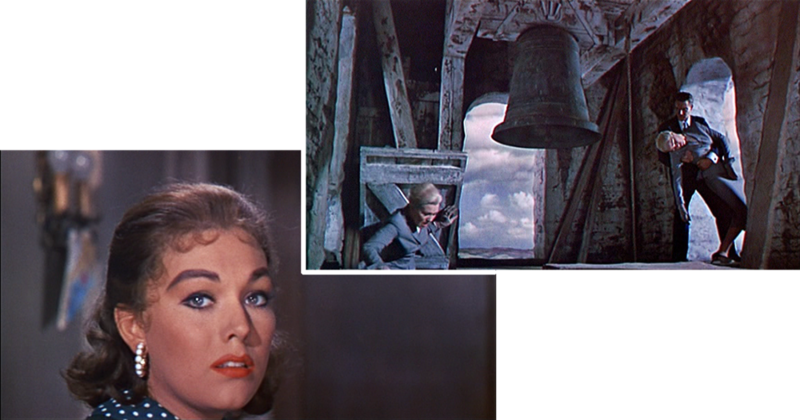 After Scottie leaves, Hitchcock boldly reveals the murder plot to the audience - Judy in flashback recalls her climb, impersonating Madeleine, into the bell tower where Elster was waiting, ready to hurl his already dead wife, the real Madeleine, from the tower. From here on the only person not in the know is Scottie. By the way, guests at the Hotel Vertigo today are treated to the continuously running Vertigo movie on a screen behind the check-in desk.